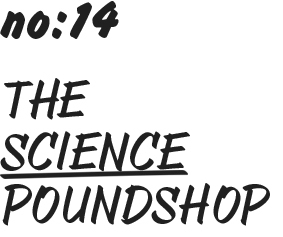 The Poundshop opened a very special shop at The Science Museum London, from Wednesday 24th June to Wednesday 1st July 2015. This time The Poundshop collection took on a science theme, with products including paper Lego spaceships by Durrell Bishop, geometric platonic solid candles from Essence & Alchemy, ‘stitch-it-yourself’ dot-to-dot constellation tote bags by Lollipop Designs and A2B wrapping paper by Lisa Jones. This time we included more price bands – prices ranged from £1 to £20! Interior designed and built by The Poundshop with help from Adrian Wu.